The women-only policty lasted until early in the 1930s. This ad appeared in the New York Times in 1926. In 1958 the New York Times reported that William Fromcheck had bought the hotel (containing at that time 175 rooms and 100 bathrooms) intending to alter it into apartments of 1 and 1/2 rooms each. 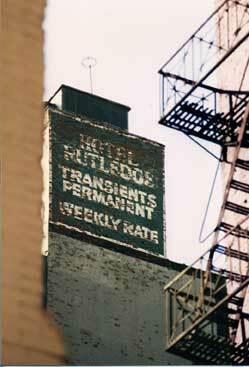 It is not clear whether these alterations were made, but the hotel continued to function as the Hotel Rutledge until the mid-1990s when it became a Quality Inn, then a little later a Ramada Inn franchise.